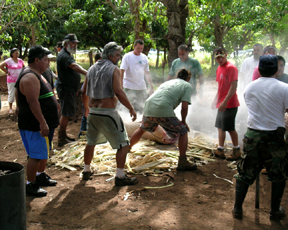 When I first moved to Moloka'i I was invited to watch, and photograph, the preparation of the Hawiian Imu, honoring the late Walter Meyer's life. 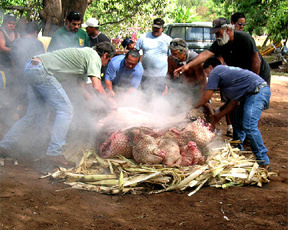 If you have ever been to Hawaii, you may have experienced a Hawaiian lu'au (feast). 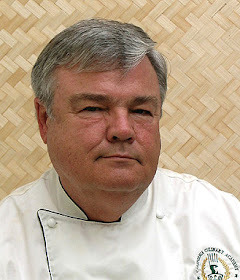 The main part of the lu'au menu is the kalua pig. 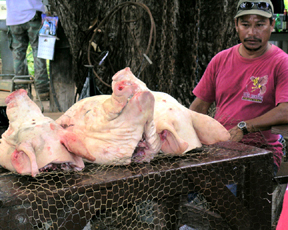 Pigs are cooked in an underground pit for hours, when they are removed from the imu, the steamed pork literally falls off the bone. 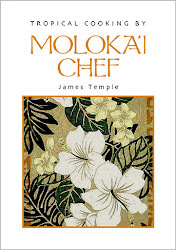 It is then shredded and served with other traditional foods for group meals, festivities, or religious ceremonies. 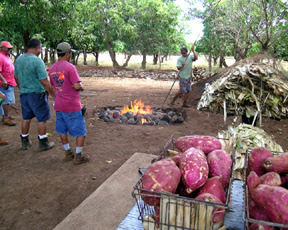 I wanted to share with you what I witnessed, the Hawaiian art of cooking in an imu. First of all, it was a man's thing, there were no women invited. 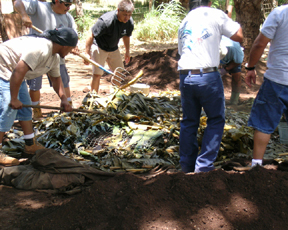 I am not sure why that was, but it must be a tradition in Hawaii for the men to prepare the imu. I was amazed at how all of these men, at least 20, worked in unison during this procedure. It was like watching a ballet. Obviously they had done this many times before. 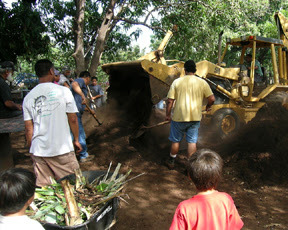 First of all a huge square pit was dug, with the help of a backhoe. 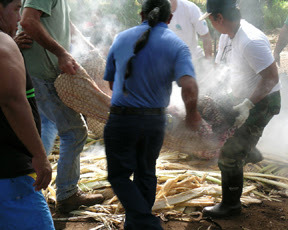 I would say that the pit was about 8 feet square and about 4 or 5 feet deep, the diameter and depth of the pit matches the amount of food to be cooked, which could be whole pigs, breadfruit, bananas, sweet potatoes, taro, chicken, and fish. 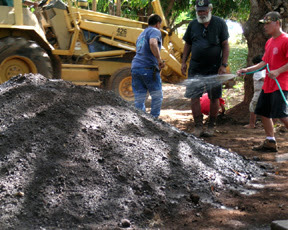 Porous lava rocks were put into the pit to cover the flat dirt bottom. 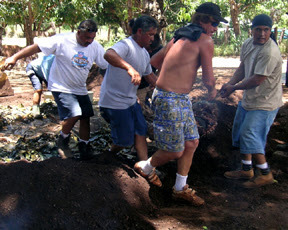 Then the hole was filled with kindling material, and hardwood logs, in this case kiawe wood. 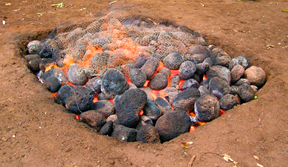 After the wood was ignited, more lava rocks were added to the top of the fire. As the wood turns to charcoal, the imu stones drop inward on the hot coals. 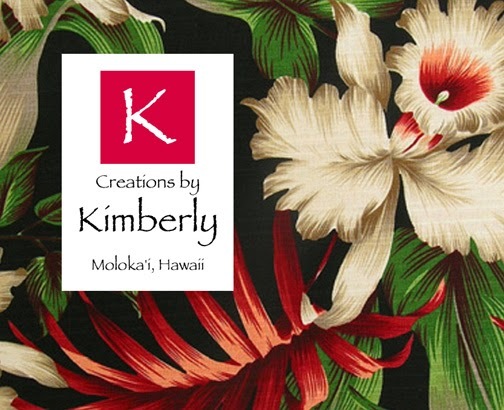 The firing time varies from 1 1/2 to 3 hours so the stones reach their maximum heat. 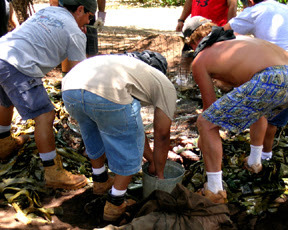 The hot stones were then leveled out with a stick to make an even floor on top of the coals. 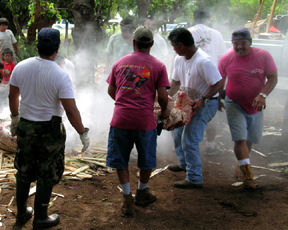 Later hot lava rocks were taken from the pit and inserted into the pigs belly to insure the pig is well cooked. 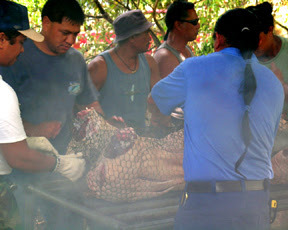 The pig was then wrapped in chicken wire to keep it all together when it is removed after cooking. 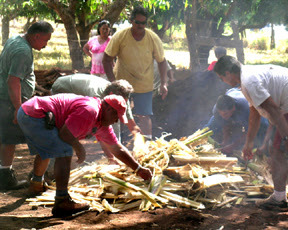 Since the cooking process requires steam and not dry heat, green plant materials were needed to create steam. 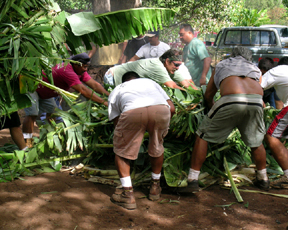 Banana stumps, ti leaves, honohono grass, banana leaves, and coconut palm leaves were gathered. Smashed banana stumps were laid directly over the hot rocks to prevent the food from being scorched and to create steam for cooking. 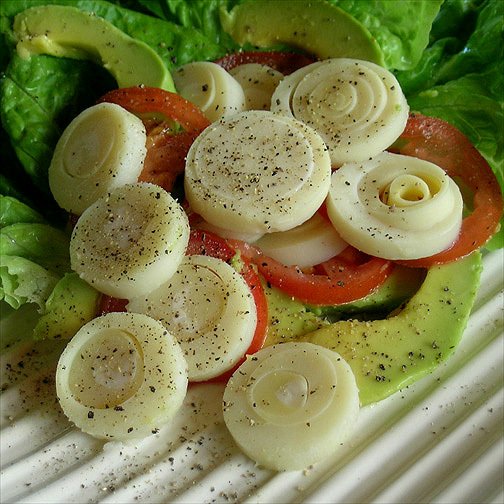 A second layer of ti leaves were added to add flavor as the meal cooked. The pigs were then placed on top of the ti leaves. 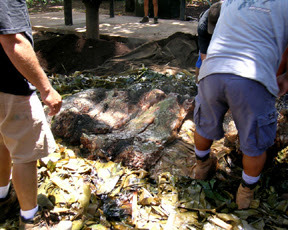 Then a third layer of ti leaves were added followed by banana leaves, and wet burlap bags. After that, the burlap bags were covered with dirt and the whole thing was whetted down with water, creating a mud cap over the imu, preventing any steam from escaping. 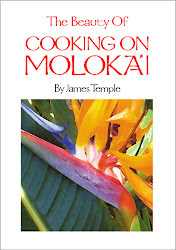 Estimating the time it takes to cook the food depends on the heat of the imu, the thickness of the vegetation, the kind of food, and the mass of the food. 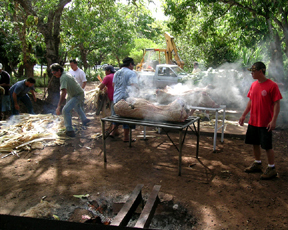 A large whole pig, in a good hot imu, may take from 6 to 8 hours of steaming time. 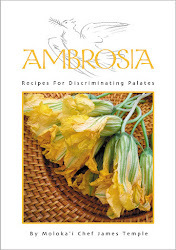 This kind of cooking takes years of experience, there is no need for a meat thermometer here. 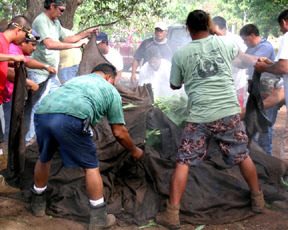 When the cooking was done, the dirt was removed revealing the steaming burlap bags. The covering material was removed, being careful to avoid getting any dirt into the imu. 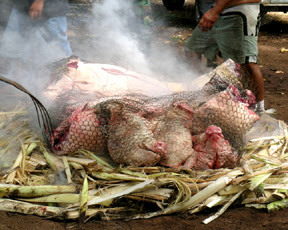 Then the hot steamed pigs were removed. Two men would grab the hot chicken wire and lift the pigs out of the hot imu and place them on large tables. 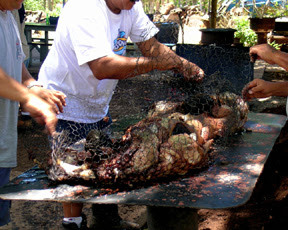 The chicken wire was then taken off and the kalua pig meat was picked. and placed in insulated boxes. 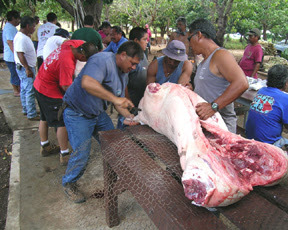 The meat was then taken to a luau, at a different location, for consumption. Some of the meat was reserved for the workers meal. 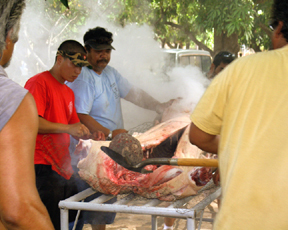 While the pigs were cooking, more dishes were being prepared for the workers meal. 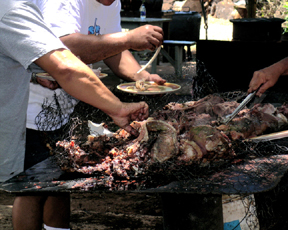 Woks, grills and large pots were set up to cook shrimp, rice, steak, and various pig parts. There was plenty of beer to go around all day. It was something I will always remember.